Thanks to FIFA’s newly passed financial transparency rules, we have for the first time confirmation of exactly how much Sepp Blatter and at least one other top official earned in their roles at FIFA. According to these numbers, the former president made about $3.6 million in 2015. Here’s a breakdown of Blatter’s salary along with his chief lieutenant, former secretary general Jérôme Valcke. The only other insight we’ve gotten into the salaries of FIFA’s top officials came in 2011, when Blatter claimed (without providing any evidence) that he made about $1 million. 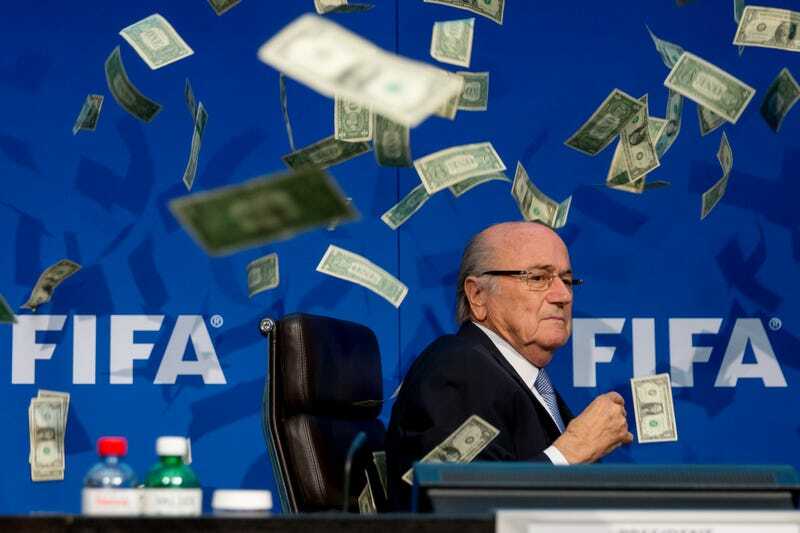 There has been somewhat informed speculation as to how much Blatter made over the years, and most of that figured that FIFA’s president had a higher salary than what we’ve found out today. Comparing Blatter’s earnings to Valcke’s and taking into account FIFA’s overall executive salary expenditures, it’s probably a safe bet that most highly-ranked FIFA positions pulled in something pretty close to those figures. Of course, it’s impossible to know the real amounts of “compensation” any one individual made in an organization as plagued by bribery and money mismanagement as FIFA (for example: noted grifter Valcke himself is under criminal investigation in Switzerland for his very own covert financial scheming), but these first steps toward transparency—however self-interested they may be—are probably a good thing. In any case, we can presume that the U.S. Department of Justice will be watching FIFA and their books very closely going forward.